The log Northwoods Bunk Beds are one of the sturdiest bunk beds available. All pieces are joined together with mortise and tenon joints and secured with bolts. Every log is hand drawn knifed to give each piece its own character and is finished in either clear lacquer (shown) or a honey pine finish. 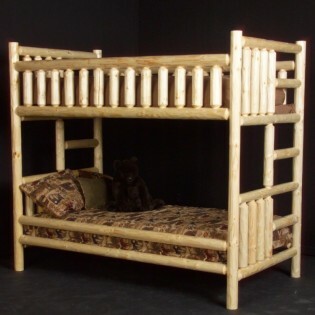 These log bunk bed meet all of the safety standards including entrapment requirements. Note: For an additional charge drawers can be added to this bed. Please call for a quote.